We’ve all seen them on TV: interrogations where the armed cop stands over a cowering suspect, screaming ― complete with colourful language ― for the perp to come clean or else. The perp is occasionally even tossed up against a wall or roughed up in some way. 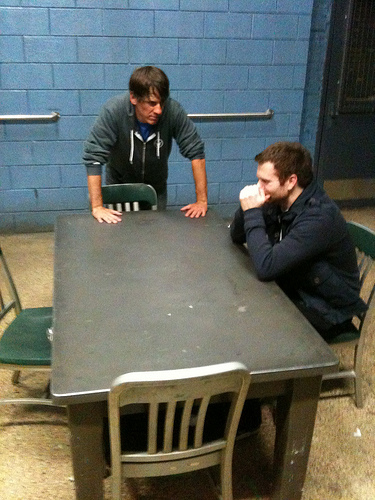 But is this really how the police handle a real life interrogation? Recently at Killer Nashville, I attended a session on realistic interrogation techniques. For those of us are trying to write law enforcement accurately, it was interesting information and really showed how inaccurate TV portrayals of officers can be (the instructor kept referring to “TV crap”). Never enter an interrogation room armed. This rule you see broken on TV on a regular basis, but the truth of the matter is that most officers are shot to death with their own gun. So the interrogating officer should never wear a weapon when entering a small enclosed space with a suspect. The number one success factor is privacy. Get your suspect alone. Psychologically, that has an immense impact on how he or she will react. Observers can view through mirrored glass, but the suspect should be alone in the room with the officer(s). Some officers prefer to make it an almost intimate setting with no table between them, simply two chairs. This allows the officer to physically reach out to the subject if he senses that they are weakening or reaching a breaking point. Keep the interview non-confrontational (sorry, Jack Bauer, you never got this one right). Interview is actually the key word here, and you want to keep the discussion conversational. The moment the officer becomes confrontational, most subjects will get defensive and will simply stop talking. Choose your words carefully. Don’t use terms like ‘kill’ or ‘steal’. Instead, try to downplay the incident in the hopes that the suspect will be more likely to talk about it. Use casual or slang terms; don’t try to intimidate your suspect with language. And absolutely no swearing while in the interview room. You’re not looking for a confession; you’re looking for the truth. Those could be two different things. Some suspects might confess to a lesser crime in order to hide a greater misdemeanour. Attitude is everything and confidence is key. If the subject senses fear from the investigator, it’s game over from that moment on. Also, know the facts of the case going in. If you go on a fishing expedition, most suspects will know immediately that you don’t have enough information to hold them. Treat the suspect with respect no matter how heinous their crime. Pay attention to every word because lies are as important as the truth. Every suspect has rights. In North America, the moment an attorney is requested, the interview must stop immediately. Hopefully this will be a useful list for those of you writing mysteries and crime fiction. I know it certainly made me look at some of my own scenes with fresh eyes.